Sophomore Curtis Harrison fights through the Bolsa Grande defense. He finished with one reception for 21 yards and two kickoff returns for 29 yards. Photos by Dante Fornaro. Quarterback Jack Simon had a record night to spark Laguna to a 16-12 victory over Bolsa Grande and earn the season’s first victory last Friday, Sept. 4, at Guyer Field. Breakers still are inconsistent but Simons scrambling and quick thinking kept the two early drives alive to control the game until the final wild minutes that almost cost Laguna the win. The game started with both teams unable to move the ball and trading possessions. 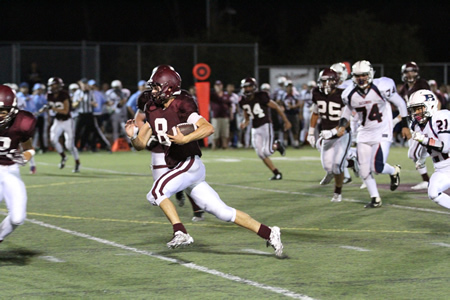 On the Breaker’s second try, sophomore Hank Syvertsen took the first carry 26 yards to the Bolsa 42. After a missed pass, Simon ran on the next six plays to set up the first score on a nifty pass to another sophomore, Blake Lusk, for the points. Simon darted into the end-zone for the two point conversion and the Breakers were up 8-0 at the mid-point of the first quarter. 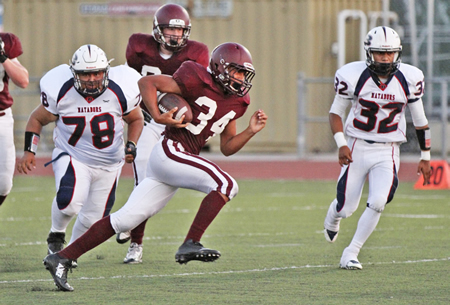 Bolsa took their next possession all the way to the Laguna seven aided by four major Laguna penalties, but fumbled their chances on the five-yard line. The visitors also missed a 38-yard field goal try early in the second period before Simon and Syvertsen put together an 80-yard drive to make it 16-0 with just under six minutes remaining in the half. Matt Hayes caught a Simon toss for the two-point conversion. Breakers threatened again but turn the ball over on an interception near the end-zone, while the Matadors missed a 44 yard field goal as time expired. Sophomore Henry Syvertsen carried 10 times for 57 yards, including an eight-yard TD run in the second quarter, to help the Breakers even their record at 1-1 with a 16-12 home win against Bolsa Grande. In the second half, neither team advanced beyond mid-field. In the third quarter, Laguna gained a total of 30 yards while Bolsa was limited with only two net yards until the final three plays of the quarter. The visitors ran off five successful runs that concluded with a 31-yard pass play for their first score early in the fourth quarter. A two-point conversion attempted was botched with an underthrown pass. The teams traded punts before Bolsa caught a break intercepting Simon on the Bolsa 44. Six plays later, the Matadors executed a half back pass and were within four points. Their extra-point kick was short. The Matadors then executed an on-side kick. With Laguna slow to react, the ball finally reached the required 10 yards and a Matador recovery. It was looking grim for the final two minutes until Adam Armstrong intercepted Bolsa’s third play of the drive, returning the ball to the Laguna 38. Two Laguna penalties cost the Breakers field position, forcing a punt with about 20 seconds remaining. Breakers stood tough and Bolsa’s final possession consisted of three plays that never threatened and the win was preserved. 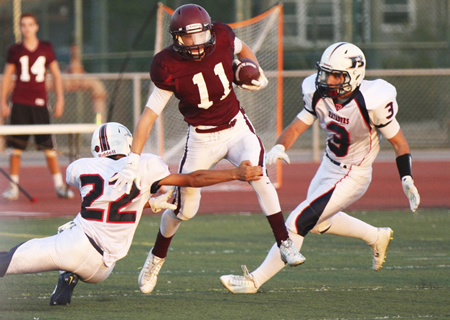 Quarterback Jack Simon carries the ball against Bolsa Grande. For Simon, the 184 yards rushing is the most by a quarterback in the 81 seasons of football at Laguna and ranks 27th overall in the school’s record book. Simon has also thrown for 2,308 career passing yards, ranking No. 10 on the all-time school list. The victory on Friday is the seventh straight over the Matadors with the Breakers dominating the series at 9-3. Up next is Segerstrom on Sept. 11 at the Jaguar campus followed by Westminster on Friday Sept. 18 at Laguna. All games kickoff at 7 p.m.